1. What are your decals made of? We use a 2.5 mil, 6 year vinyl for most decals. We also print on reflective vinyl and we have a new product available that has excellent conform-ability to curves which makes it a great choice for larger stickers or for those that are more concerned about getting their decals on without wrinkles and bubble free, however our regular vinyl works well for most situations. We use thermal transfer ink for greater durability which is good for 3-5 year exterior use. 3. 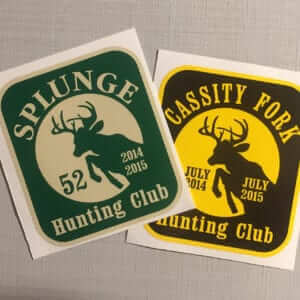 Can you make numbered stickers-decals? Yes we can sequential number decals and stickers. 4. Can you provide Rush Orders? We usually can for an additional fee. If you want your stickers shipped within 48 hours (Mon.-Fri.) with Next Day air UPS shipping. Most Rush Order are shipped the next business day, but you can call us to check our schedule at 225-567-1900. 5. Can you print custom shape decals? 6. Do you print in spot colors or 4 color process? 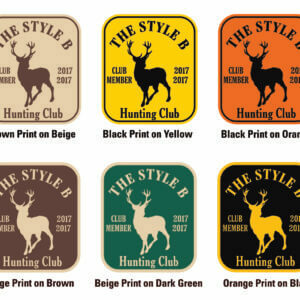 Our Helmet Decals can be printed in multiple spot colors as well as 4 color process with a digital printer using thermal ink which has a 3-5 year outdoor life. 7. Can you provide large order of decals and stickers? 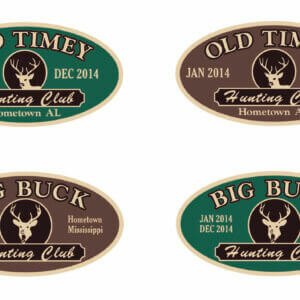 If you are not in a hurry or need very large quantities our Stouse Stickers are a great value. 8. Why use Hard Hat Hard Stickers? Hat Stickers have many uses, from promotional items to safety training and security. Giving Helmet decals to potential associates and customers is a great way of advertising and promoting your company. Hard Hat stickers are also used for company identification (branding) and if security is an issue, numbered decals can help you keep track of a large work force. 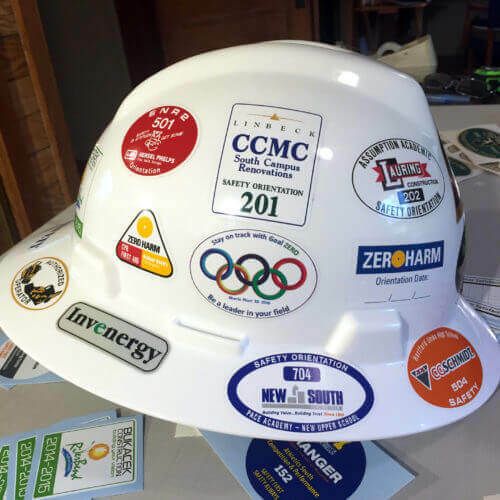 Hard Hat stickers are also a great way to promote safety when given out as awards for working safely and as constant visual reminders of safety issues. Guarantees – Vinyl letters, decals and stickers made by The Sign Shop Inc. are guaranteed for one year unless otherwise specified. Ordering – you can order using our online shopping cart, email, or phone. We accept Visa, Mastercard, Discover and American Express. If you prefer to set up a billing account please contact us. Shipping – We will ship via UPS, or the U.S. Postal Service out our discretion unless otherwise specified or requested. Review Proposals and Orders – Read and approve orders/proposals before ordering. By placing the final order you are accepting that the order has been viewed and approved. The Sign Shop, Inc., D.B.A. theSignShop.com cannot be held responsible for any discrepancies that might be overlooked during the ordering and customer review process. Disclaimer – Pricing, product availability, and policies are subject to change without notice. Due to possible pricing errors and manufacturer price increases, the prices on our site are subject to change at the time of order fulfillment, however you will be notified if such a change will occur. We strive to provide the best images and color representations as possible of our products, but we cannot guarantee an exact match, the product images should be considered representational of the products. We strive to be as accurate as possible in the information on our website, however we are not responsible for typographical errors or technical inaccuracies. Returns – Any product that is defective due to material or manufacturer defects will be accepted for return. Inspect packages immediately and report any problems within 10 days of delivery. Call 866-781-1272 for a Return Authorization Number. All returns must be made within 30 days of purchase. No C.O.D. returns will be accepted; we do not pay shipping costs for returns. Letters, plaques, signs, decals, stickers and other custom item orders are not returnable due to their custom nature. Please request a proof of the final layout when you order custom items. Check and confirm all spelling and letters sizes if applicable. Mistakes are made at times and we will do our best to correct such errors made by us by redoing the order or refunding your money. Proofs – For custom orders like signs, decals and stickers we can provide you with one proof prior to producing your order. If multiple proof changes are required, you may incur additional charges, however you will be notified if this is necessary. If you wish to cancel your order due to dissatisfaction with a layout a $25 fee may be accessed and the balance of the order price will be credited back to your credit card account. Colors of layouts are representational and the actual colors may not match the colors on your screen. Liability – The Sign Shop, Inc. D.B.A. theSignShop.com nor the manufacturer shall be liable for any injury, loss or damage to property or persons due to the use of our products. You are responsible for the suitable use of our products for their intended purposes and shall assume all liability herein. Copyright Infringement – If you believe your rights under applicable copyright laws are being infringed on by theSignShop.com, notify us for removal.